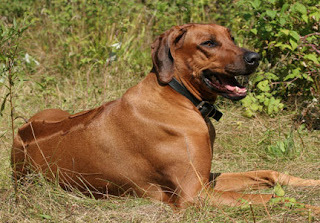 The Rhodesian Ridgeback is one of the most obedient and friendly breeds in the world. They do well with children and other animals. Its known to be brave and can be difficult to train, if they are treated badly. This breed of dog requires, early socialize and obedience training, known to be intelligent, energetic and protective of their owners and homes. They should not left alone for long time, they get bored and can become destructive. This breed is known for their hunting skills. They are very loyal to their masters, they are well suited to home life, however, they do better with single owners. They treat strangers with caution. This breed of dog has a short dense coat, they have very distinct marking along their back, which is created by hair, that grows in the opposite direction. They require training at an earl age, to prevent future difficulties, the training must be consistent and straight, avoid the harsh and hard methods of training, because they will not respond to such methods, training must be given to them as compared to their abilities. This dog is very active, energetic and play full, they love to go for a long walks and for jogging, they should have at least an average sized yard. This breed of dog is easy to groom, brushing should be done on a regular basis, to avoid dead hair and dirt and bathing only when required. This is a tough and hardy dog breed known to withstand teperature extremes and is not known to have many disease, however they are susceptible to hip dysplasia, dermoid sinus, and cysts. The average lifespan of this dog breed is 10-12 years.